I’ve worked with Chrystene before in a professional capacity and was initially struck by her passion for the people and projects she works with. 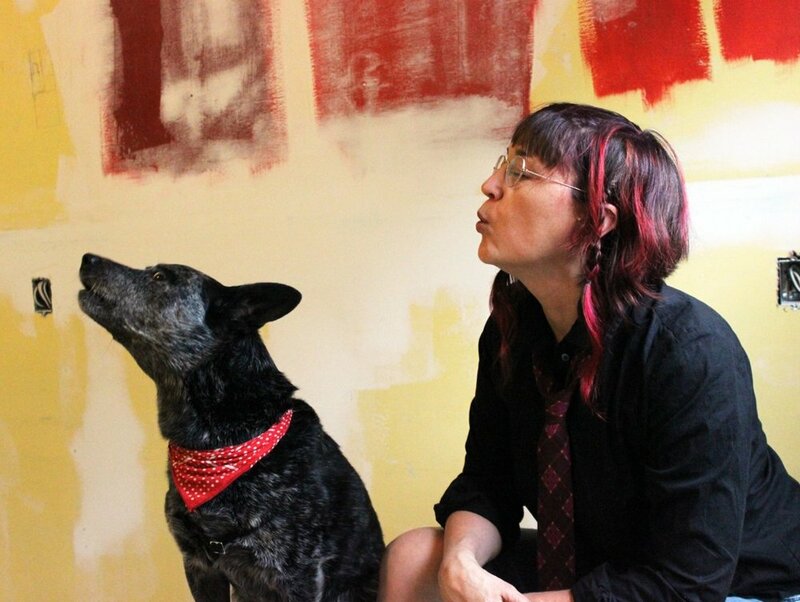 When we met for her portrait she was accompanied by her dog Moxie Moxikin the Dingo girl who showed off for me by climbing ladders and whizzing down a slide. Moxie also happens to be the the inspiration for Chrystene’s film company logo animation (Moxie Films). It was such a treat to work with someone so thoroughly invested in both the arts and the well-being of others. Plus, I loved having the chance to shoot a pup-portrait as well! Meet Chrystene and Moxie. For the past three years I have been having the most gorgeous, rich experience working with senior citizens, along with Regina artists Rowan Pantel and Berny Hi through Common Weal’s community arts program. We have been helping folks in permanent care homes and seniors’ centres create assemblage boxes and art journals about their lives. About 10% of the people we have worked with have passed away since making their boxes and telling their stories, so there is a strangely sweet urgency in all of it for everyone involved. The sharing and recording of meaningful personal narratives, and assisting with artmaking around memories are among the most precious gifts of my life. There has been much laughter, touching of hearts, and many tears of both joy and sadness for me. Also this summer I have had the greatest time working with a group of Blind and partially sighted artists through a program at the MacKenzie and Dunlop art galleries here in Regina. The group created a great variety of art works, and together we developed some new approaches to painting using textures, such as paper and glue buildup, to create images that can be seen as well as felt with the fingers. The exhibition for this program will open on October 4th at both galleries. Additionally I am on the board of The Cabinet Inc., a local organization that is currently planning The Caligari Project, an immersive vast German Expressionist festival of film, music, performance, visual art, and academic discourse for the fall of 2016. I am currently working with my puppet cohorts, the Prairie Puppet Underground, dreaming up a puppet-themed German Expressionist side show for that, complete with Somnambulist fortune teller! And there is always the next International Puppet Underground Festival (IPUF) of films and puppet performances to plan, coming up in the spring of 2017. Because of these and other projects, I have had to put my own art practice on hold for a few months over the summer, but I intend to return to my own work in the winter. I have at least a dozen paintings, three films, an animation, a couple of puppet plays, and at least one graphic novel I am aching to get to. I don’t really have a regular day job, as I kind of float from one art project to another, but I am just one day into my residency at Thom Collegiate in Regina, where I will be working with the amazing Joanne Weber, the only Deaf teacher of Deaf and Hard of Hearing (DHH) in Saskatchewan. Many DHH youth in Saskatchewan have extremely low literacy rates (often as low as Grade 1 or 2 reading levels), most are not fluent in sign language, and many have very limited speech, writing, and lip reading skills. This is an exceptionally isolated community, and Joanne and I are embarking on a year long experiment on Art and Literacy with her students, exploring ways that art making and art studies can help improve literacy and understanding for these young people. It sounds crazy, but there is new research being done in this area, and Joanne is focusing on this as her doctoral thesis at the University of Regina. Our pilot project in the spring was incredibly successful. In three months some students progressed two whole reading levels after delving into an Arts and Literacy program that Joanne and I created together. So we have an entire year planned that includes everything from learning art theory such as colour and design theory, drawing and painting, sculpting, creating dioramas of the inner landscape, mask making and mask play, puppetry, ASL Poetry (a performative kind of American Sign Language with its own unique rhythmic and rhyming structure(, digital graphic arts and video, and a multimedia community performance at the end of the year. Local filmmaker Berny Hi will also be joining us in the spring to share some of his skills with the students. It is a great experience being with Joanne and her students in the classroom, and I am very excited about the upcoming year, but there are a number of challenges! Even though I sign, I am very poor at ASL grammar, so while I teach artmaking, the students help me get better at signing. As a Hearing person I am learning about ‘audism,’ a particular form of discrimination members of the DHH community experience on a daily basis. Audism takes many forms, and I am working to be aware of some of the more subtle forms, many of which have to do with communication, such as making sure my face and is well lit when I speak to the students, remembering not to look away while talking, and making sure not to have oral discussions with other Hearing people in the room with the students. The students have their own brand of youthful challenges like any teenagers, and additionally are struggling academically and in some cases culturally. However, they throw themselves into the art making and there is a great deal of laughter and – yes, some tears on my part – when they make connections or leaps in reading or art skills. I am looking so forward to seeing what happens with the students this year! What is most important to me are compassion, love, exploration, sharing, animals, vegan cuisine, and the creating of art in any form. Regina is a magical city! You may not know this, but dreams come true in Regina. Beautiful dreams you didn’t even know you had just manifest here. It’s of course because of the people in this town. I love how open people are, how curious they are, how much the arts are celebrated and loved here, and how welcoming this city is. I came here from San Francisco nine years ago, and Regina’s sparkle has never worn off for me. I felt like I discovered a hidden gem, this little diamond suspended in a giant agricultural wheat sheaf. It’s hard to think of something negative to say about Regina because I am really loving this city right now. It’s just gotten better since I’ve been here. It’s almost a decade long love affair and it just gets stronger all the time. I know it’s got its problems like any city, like poverty, racism, and a bloody past, but for a modern western city, I think Regina is pretty great. I guess in a perfect Regina there could be fewer mosquitoes, more vegan options, and more places open late and on Sundays. Saskatoon seems like a beautiful and happening city with a really exciting arts scene. I have barely explored it but everyone I meet who knows Saskatoon loves it, and everyone I meet from there seems very cool and like they come from a strong community. I hear the theatre scene is terrific in Saskatoon, and that is one thing I do miss coming from San Francisco. I have decided to love the winters. Coming from San Francisco, I was a pretty big baby about the first few winters, but a couple years back, in November, I went to Peavey Mart and I bought some farmer padded winter overalls. I switched gears and just started getting more excited and exuberant the colder it got. Blizzards put me over the moon. It makes winters a lot easier when you love them. I still don’t like to go for long walks in the middle of the night when it’s 40 below like you crazy Canadians, but I’m working up to it!